Xanthos is an ancient Lycian city located on a ridge 7.5 mi. [12 km.] inland from the Mediterranean Sea. It was the chief city of Lycia and was controlled at various times by the Persians, Greeks (it surrendered to Alexander the Great in 334 B.C. 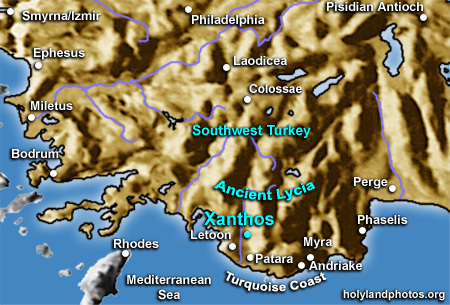 ), the Ptolemies (from Egypt), the Seleucids (Syria), the Island of Rhodes, and eventually prospered under Roman Rule as the leading city of Lycia in the Roman Province of Asia. Xanthos is a well–preserved site, with Lycian, Hellenistic, Roman, and Byzantine remains—this in spite of the fact in the mid 19th century Charles Fellows removed many of the most prominent artifacts to England. They are now housed in the British Museum.